Whatever the world may say. to God, His Mother and you. Today is St. Brigid of Ireland's Feast Day. Some years, I'm really good about celebrating feast days, some years I am completely lax. 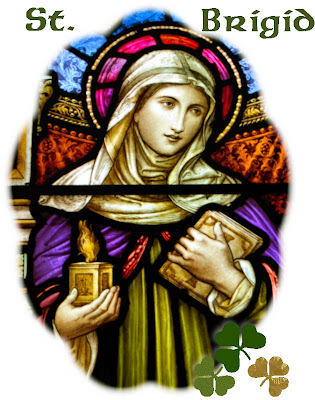 I'm trying to do better this year, and since St. Brigid has always been a favorite of mine, I'm glad I remembered today was her day! I'm thinking of making some Irish Soda Bread to celebrate her day. It's a delicious treat, and I almost always have all the makings in the house. First, though, I need to get through a long dentist's appointment, so we'll see if I make it today or tomorrow.